How to sort a column with numeric data in GridDataBoundGrid? 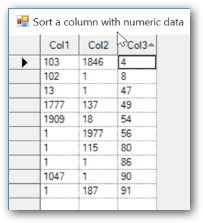 To sort the column with numeric data, it can be handled by customizing the sorting with IComparer. In this sample, sorting comparison can be done by IntComparer which is derived from IComparer. Sorting behavior might be single click, double click or none can be handled by SortBehaviour. Here, a helper class `CustomSortHelper` is used set the custom comparer for the columns. `IntComparer` derived from the IComparer which can be used for compare the x and y indices.